This travel trailer has so many convenient features, you'll feel right at home as you camp. The private bunkhouse gives the kids their own space, while mom and dad enjoy the front private bedroom. Invite extra guests with a sleeper sofa, and a u-shaped dinette that can be used for additional sleeping space. This unit conveniently includes a full bath, plus a half bath with it's own exit door to the outside. You'll appreciate the extra space that the slide out in the living area gives, plus the oversized panoramic windows provide extra light and a view of the outside. Bring along the yard games or the kids' scooters with exterior storage, and you'll find two pantries insides, as well as overhead storage for all your valuables. 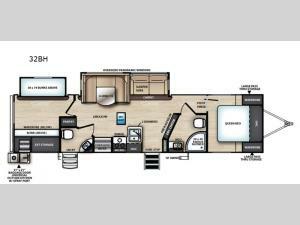 Come make this travel trailer yours today!